At the end of October 2013, a group of Year 12 and 13 from our school went on a History and Chemistry trip to Washington DC, United States. Accompanied by Ms Hoban, Ms Wylie and Mr Walker, we arrived in Washington and welcomed by our all-American tour guide, Dwaine. After a short bus journey (accompanied by a Historical introduction) we arrived at the hotel to find a surprising amount of pizza and cookies awaiting us. After a good nights sleep and a traditional American breakfast we met Dwaine, who led us on a walking tour of the city. We made our way to the White House via the Metro and on our way we passed many monuments and buildings such as the Jackson Statue and the Eisenhower Executive Office Building. Designed by James Hoban, the White House construction began with the laying of the cornerstone on October 13, 1792. Reminded by our tour-guide that the White House was set ablaze by British troops in 1814, we took a refreshing walk along Constitution Avenue towards the Vietnam Memorial. The Vietnam War of 1954-1975 was a tragic time in History and we definitely saw how high number of casualties when arriving at the memorial. Looking at the walls full of names of those who lost their lives or were wounded, it made us realise how significant the losses really were. Nearby we visited The Three Soldiers statue which was very thought-provoking. Soldiers often placed their dog-tags on the shoe, as it was considered to be the area most prone to attack. At the Lincoln memorial we experienced a breathtaking view of the Washington Monument and after a stop for lemonade we visited the Smithsonian Museums. At the museum of American History students got to see exhibitions such as American Culture, America in times of War and the gallery of First Ladies. The section about the American Civil War and War of Independence were particularly useful towards our History curriculum. Many students also visited the Museum of Air and Space which had a large range of displays including Airplanes, War tactics and Spacecraft. One of the favourites within the group was The Natural History Museum where the Hope Diamond was on display. Some students visited the National Holocaust Museum, dedicated in 1993. After the long day of sight-seeing we spent some time at the shopping mall before returning to the hotel for a well-deserved rest! On the Wednesday, it was another beautiful day, and we walked through the city to Capitol Hill. Our first visit was to the Capitol itself, huge stately building with a great dome on its roof. We were shown around some of the rooms and told a little about its history; The Capitol was built in the late 1700s/early 1800s, and was much smaller then than it is today. New wings had to be added at various points in history as more people came to work there. It was burned down by the British during the War of 1812, but apparently we needn’t feel too guilty about this, as it meant when it was repaired, the building was improved, replaced by a much larger Capitol. The inside of the dome has a beautiful fresco depicting the founding father, George Washington, with 13 maidens, and surrounded by Roman gods and goddesses. Unfortunately we couldn’t actually go to see the dome itself, but we were shown models of it, one of which had a reproduction of the image. We were privileged to be able to go into the Senate while they were in session, and watch them vote. It was very interesting to see how it all worked, and also quite entertaining to see how different people cast their votes. Some came in and went right up to the woman recording each answer, others called out their votes to her. One man didn’t even say anything, he simply gave her a thumbs-up, and kept talking to a fellow senator! We also saw a glimpse of Senator John McCain, who ran against Obama in the 2008 presidential elections. After leaving the Capitol, we went across the road to the Supreme Court, where we had the opportunity to explore and see the various exhibits on display. We then went to sit in the courtroom, where we heard about how the court is run: there are 9 justices, one Chief Justice, and 8 associate justices. They determine matter relating to the Constitution, so not every day complaints, but large-scale debates. All new laws must pass through the Supreme Court – it is the highest legal authority in the US. In the evening, we went into the city for a bit of shopping, and a trip to the cinema – a great way to relax after a very busy, exciting and informative day. 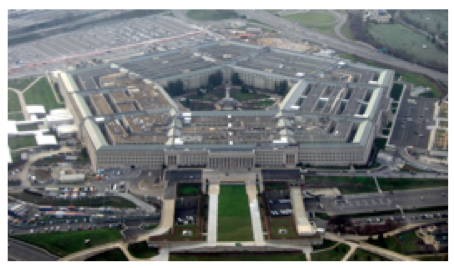 The Pentagon is the largest office building in the world, with seventeen and a half miles of hallways. It is so large that it has been assigned six different zip codes. There are 23,000 employees in the Pentagon with more than 200,000 phone calls and 1 million emails sent everyday. Windows in the building are two inches thick, weigh one ton each and do not open. There are 691 drinking fountains, 131 stairways and 19 escalators within the building. We also saw the Hall of Heroes where the names of those awarded with the highest Unites States Armed Forces decoration of bravery, the Medal of Honor, were listed. We were all surprised to discover that only one woman has been awarded a medal of honor in history. Mary Edwards Walker served during the American Civil War as the 1st Female U.S. Army Surgeon. En route to Georgetown, we stopped off at The Arlington National Cemetery where we saw the graves of brave solders who lost their lives in WW1, WW2 and the Vietnam War. The endless fields of graves really put things into perspective and made us realise how many lives were lost throughout these wars. A few of the students visited the grave of John F Kennedy, the 35th President. We then took a short trip on the metro and shuttle bus to Georgetown University, on the other side of the river. After a quick lunch, we had a tour around the University campus and found out many interesting things about the higher education system in the US. We enjoyed hearing about the University’s crazy traditions and rituals! Overall, the trip to Washington was a fantastic experience. It shall definitely be useful toward the IB diploma courses for both the Science and History students.